India’s best kept secret is at the northern tip of the country. From there, you will be able to see the iconic Pangong Lake screened in the 3 idiots movie that has been on everyone’s dream destination since 2009. I will be sharing with you my budget backpacking 10 days itinerary getting from Delhi to Srinagar, then onward to Leh and down to Manali. 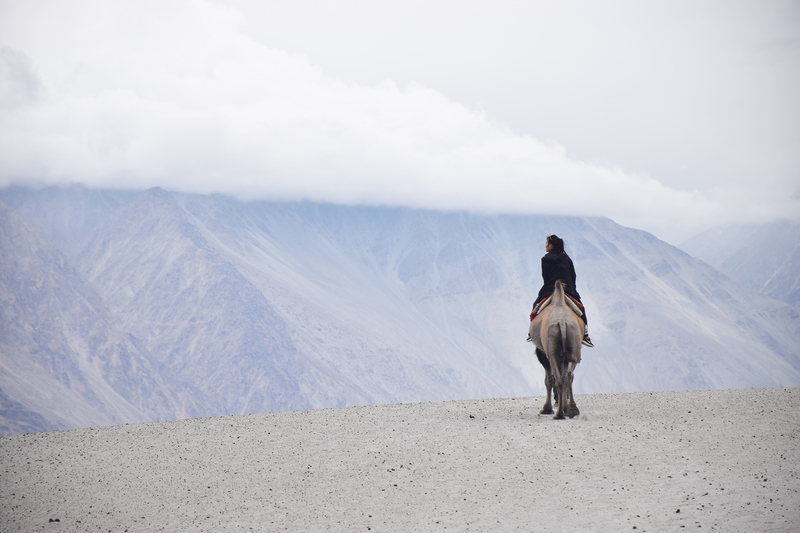 If you’re looking for a budget backpacker’s itinerary for Ladakh, you’re at the right place! 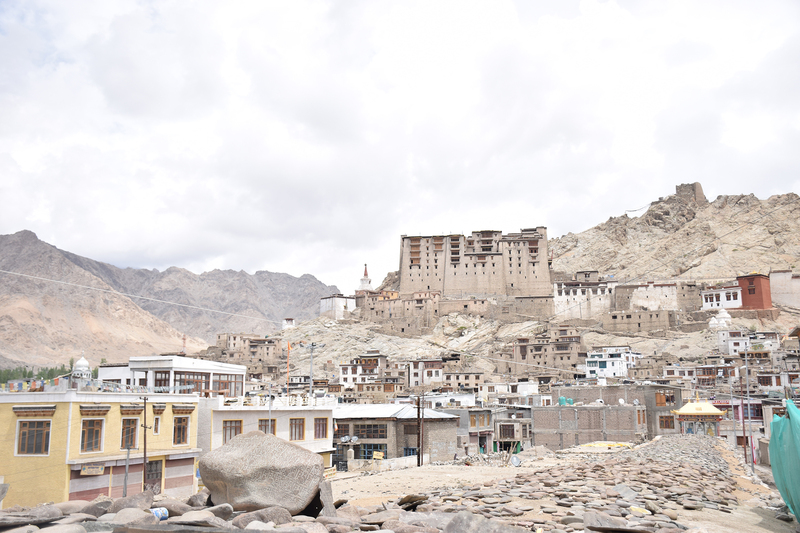 I did the trip with my bf, but it is also completely possible to do this as a solo trip because the places in Ladakh were relatively safe in my opinion. We survived without buying a data card! The tip is to download google maps before you arrive and everything will work out just fine. Prior to my arrival, I read many horror stories online that when you visit India, you need to be cautious of everyone and assume that they are all out to scam your money. BUT the good news is, when I was there, every local we met at Ladakh itself was so friendly and helpful! 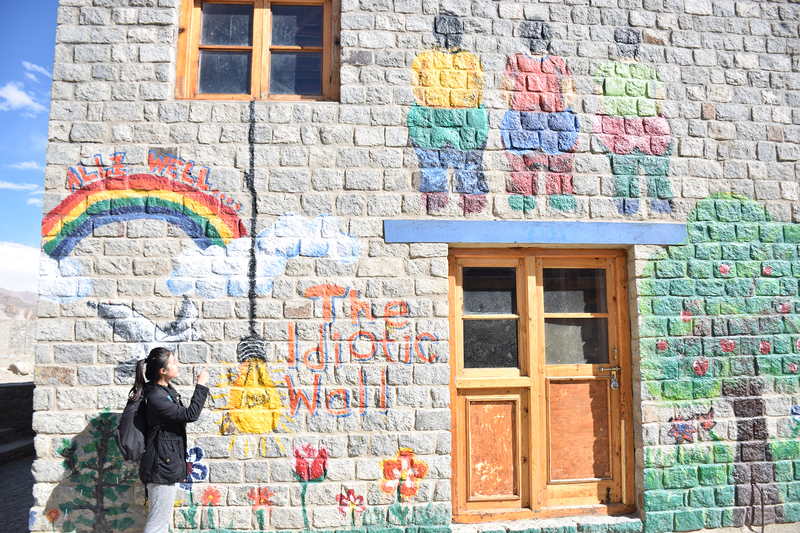 Tip: DO NOT BOOK ANYTHING BEFORE YOU GET TO LEH. It is MUCH CHEAPER if you do it at the place itself. Similarly for accommodations, book it when you reach the hostel/guesthouse/hotel. That way, you can bargain for a lower price. Budget: $1200 (upper bound), I spent less than that for the necessities, so ended up using quite a substantial amount of excess cash to shop around on my last day. After having Leh, Ladakh on my bucket list for the longest time, I finally made the decision to travel there. If you’re thinking of whether to go, PLEASE JUST GO! It’s probably one of the nicest sight in India, the people there are also extremely nice. How can one resist the place after seeing Pangong Tso being featured on The Three Idiots movie? Day 1: Fly from SG – Delhi. Upon landing at 6am, we bought a domestic flight from Delhi to Srinagar on arrival which costs us about 7600 rupees (~$160 SGD) which was really expensive in my opinion. Worse still, we had to take a taxi at the prepaid taxi booth for 100 rupees to get to the domestic terminal, and the guy at the counter tried to scam us of our money, what a party pooper! After arriving Srinagar, I had a completely culture shock. Military soldiers were standing around every 20m apart from each other along the airport, in fact you see ALOT of soldiers everywhere in Sringar, it was pretty frightful to be honest. I guess this is what it is when you’re at a place that’s considered to be a disputed territory. We stayed at Swiss Hotel (some random budget accommodation that my partner found). It costs 1400 rupees per night (bargained down from 2000 rupees), and the room was pretty decent. After lunch at Lhasa, we hung around Srinagar and took a taxi to some famous mosque in the city (who eventually became our cheap local guide for the day), we went to a few mosques followed by several botanical gardens and watched the sunset over Dal Lake. Day 2: Sringar to Leh jeep ride. Woke up pretty early at 6ish and took a tuktuk rickshaw to this shared jeep taxi stand just opposite the central bus station from Srinagar at 7am. Basically you pay a fixed price and the jeep will only depart when the vehicle is filled (~7 passengers). The prices vary depending on the seat you choose. First row costs more expensive, second row is middle pricing and the last row is cheapest. Trust me on this, PLEASE PAY MORE FOR THE FIRST ROW SEATS simply for 2 reasons: 1) Comfort level for the next 14 hours drive. 2) Better picture opportunities along the way. I paid 2100 rupees, but honestly was lucky to be able to get the first row because the two people that took the first row backed out and I managed to get their seats. If you had to sit the last row for 14h, I guarantee you are going to vomit along the way or have a massive headache unless you’re so used to being on extremely bumpy and long rides with 0 motion sickness. 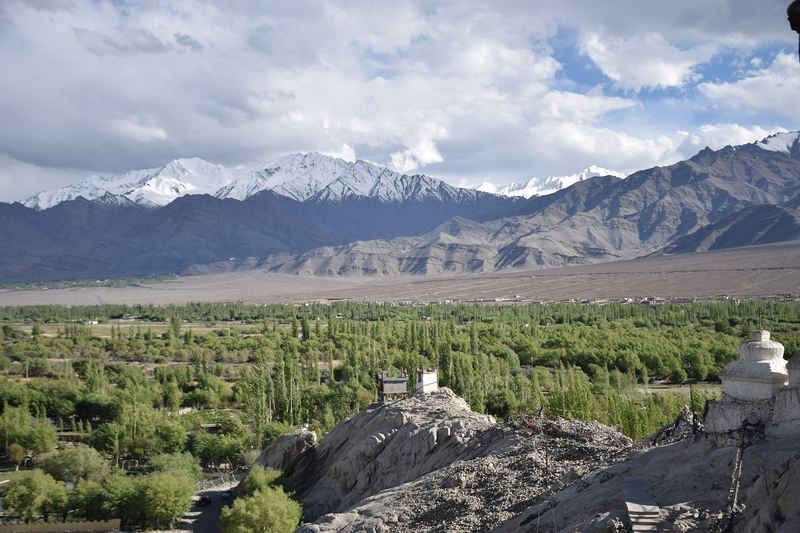 There was an alternative option to get to Leh, which was to take a bus to Kargil then to Leh. Some say that’s needed to acclimatise better, I personally did not think that was necessary because you’d waste a night at Kargil (nothing much to do there). Also, you can rest 1-2 full days in Leh to acclimatise instead. Another alternative route we could do was to go from Delhi to Manali then to Leh, which we didn’t want. We read so many articles on this and decided that it was much easier to acclimatise from Srinagar to Leh (I do not advise anyone to fly to Leh, unless you’re certain you won’t get altitude sickness). Also, as we went in early June, the roads from Manali to Leh may not be opened yet and we didn’t wanna risk it. We spent entire Day 2 travelling on the road from Srinagar to Leh, it was needless to say breathtaking, albeit sick in the stomach from the long duration. Something I learnt to avoid getting altitude sickness is to DRINK ALOT OF WATER. I drank 2 litres while on the road and it really helped me SO MUCH! Also, because of the water intake, I needed to release my bladder really frequently and learnt to really just pee out in the open. At that point, all I really cared about was my comfort level and I didn’t wanna risk getting sick or my next 10 days would have been ruined. Arrived at Leh at 9.30pm, randomly found an accommodation called Jigmet guesthouse that was quite near the alighting point of the jeep. Pretty pricey at 1500 rupees for a double room with toilet but it has a good location. We were so exhausted so we settled for it just for 1 night. Day 3: Checked out of Jigmet guesthouse to hunt for a cheaper accommodation option and eventually settled at Rainbow guesthouse which costs 1000 rupees a night (double room with attached toilet), darn good deal! When you’re there, get them to show you the “older” rooms because they’re cheaper but they’re as good! The lady boss was extremely nice too, I really loved our stay there that we came back to stay with the after our trips to Nubra & Pangong. On your first morning in Leh, please ensure you go get your inner line permit done with a tour agent (you need a tour agent for this) because it takes a day to get it done, costs 700 rupees for foreigners (please don’t get scammed even though most of them are genuinely nice). We tried finding different tour agencies for a shared jeep for a 4d3n Nubra Valley + Pangong Lake + Tso Moriri but to avail. None of the tour agencies had jeeps that were departing the following day, or that they were fully booked (it was the start of the season). If we insist on going the following day, we still could but we had to pay the full jeep cost on our own, which was definitely way out of our budget. We put up a notice to find people to share a jeep with us outside some of the tour agencies (yep they allow you to do that). 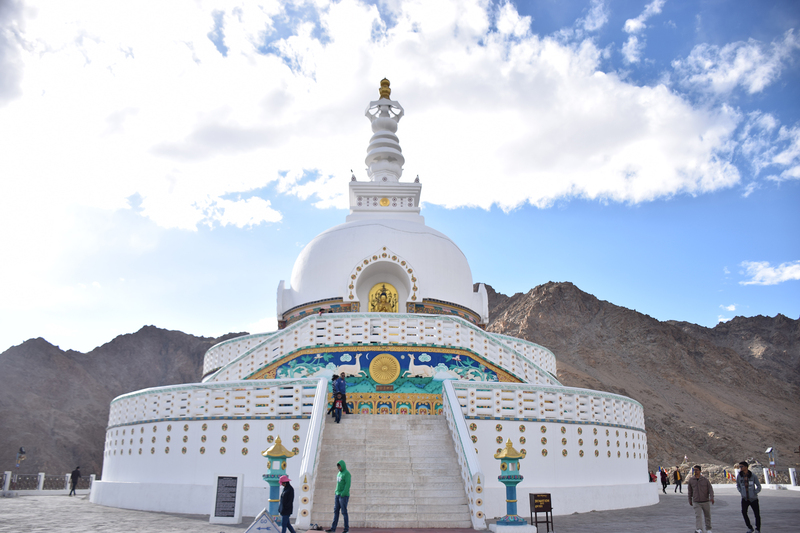 While waiting for everything to fall into place, we did a climb up to Shanti Stupa (amazing views of Leh!!). Ate at ll Forno for dinner (really good wood fire pizzas for around 250 rupees and nice lagsane for 250 rupees). You can even order beer even though it’s not on the menu, there’s also free and pretty stable wifi. When it got late, we realised that it was not possible to find other people to share the cost of a jeep with us for the following day. So we decided to try our luck again the next day. Here comes the epic part at night. My partner suddenly had REALLY BAD altitude sickness. His headache got SO BAD, and started vomiting at 4am, we had to rush him to the hospital immediately. The kind guesthouse owner drove him down to the hospital at that timing! He immediately got 2 injections (10 rupees each SO CHEAP LOL, and don’t worry it’s completely legitimate fresh out of packaging kind) and they put him on an oxygen mask for the next 2 hours. He felt better subsequently, apparently it’s very normal because we saw a few patients that got hospitalised too who were on the oxygen mask too. Day 4: After being discharged from the hospital, we continued our hunt to find for a shared jeep. We decided to change our plans and do a 3d2n Nubra Valley, Turtuk (furthest village you can go that’s right beside the Pakistan border) and Pangong Lake because it seems more likely that we’d find someone. Thankfully, we managed to find an Indian couple that was able to share with us the jeep! I can’t remember the exact price, but it’s all a fixed rate based on the number of people sharing the jeep. I think it was around 8000 rupees per person if I’m not wrong for the 3d2n trip, excluding accommodations. But phew, boy we were so relived to be able to find two other people to share the cost with us! Ideally, we would like to have 2 more people on board with us to lower the cost, but I guess this wasn’t too bad as well. At least we have a comfortable SUV instead of a jeep due to less people. You definitely want a comfortable ride throughout because it was hella bumpy (most roads are not even paved)! Spent the rest of the day getting a day tour around Leh with a taxi (again, from a tour agency). 900 Rupees for a 3.5h trip to get us to Shey Palace, Thikse Monastery and the 3 idiots school. Also, ate at apparently the BEST Momos at Gesmo restaurant in the city itself. Day 5: Started our 3d2n trip trip at 7.30am at Leh. Went to Nubra Valley and passed the highest motorway Khardung-la Pass, then to diskit then Hunder (for the sand dunes and camel riding), then to Turtuk (the last village before you hit the Pakistan border). Be prepared for the COLD! 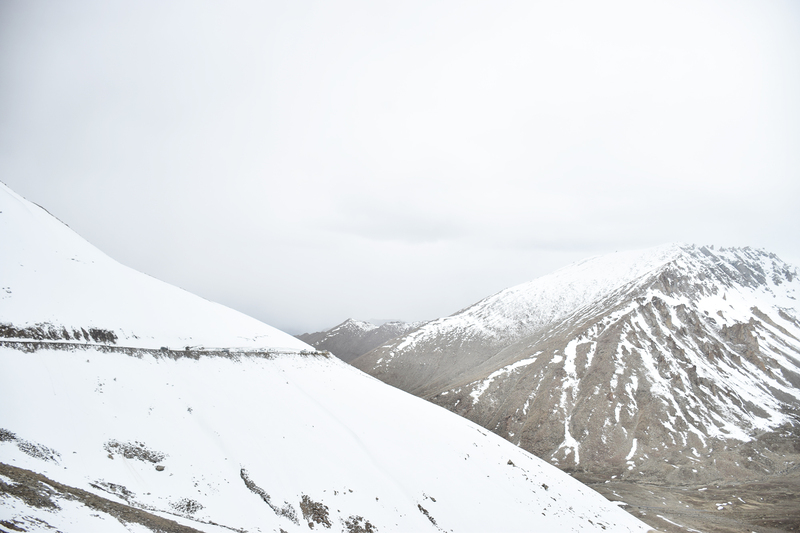 It was snowing heavily at Khardung-la Pass and it was hella cool! (pun intended). My bladder was bursting and all the toilet doors were STUCK because the ice was all frozen and could not really close, so were the “holes in the ground” meant for your pee, they were all piled with snow, that I just peed on the snow itself. That was definitely one of my most memorable experience because of how disgusting it was but I’m actually grateful for the experience. I was really freezing especially since I came from a tropical country. Please ensure you bring enough clothes. I brought clothes intended for summer and definitely wasn’t prepared for a summer like this. I had to re wear my only pair of jeans and coat for the entire trip. Apart from the cold, the views were amazing! Love every bit. For those who are contemplating whether to go all the way up to Turtuk, my answer would be yes!!! We almost didn’t want to head there, but I’m so glad we did. The villagers there were SO NICE! 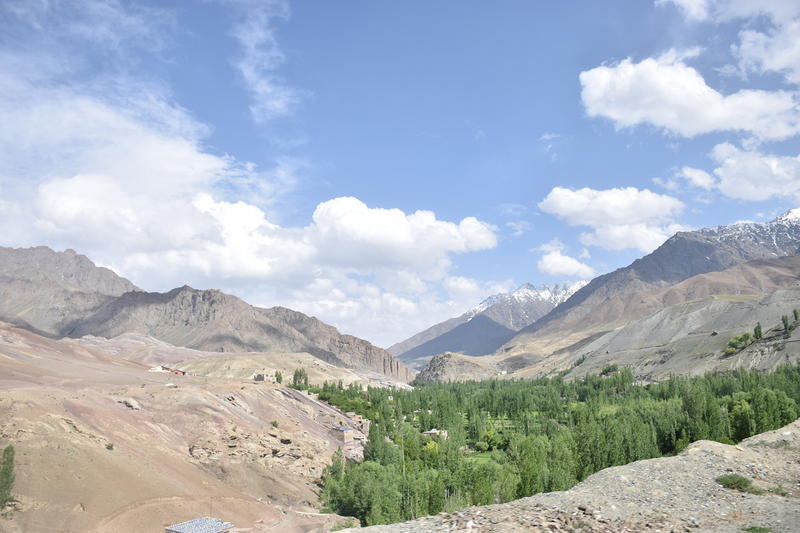 It is recommended to stay at Turtuk than Hunder for better, more and cheaper accommodations. We stayed at this new guesthouse (Ashoor Guesthouse, it’s very deep in when you drive along the main road in but I really recommend it!!) for 600 rupees for a double bed, shared bathroom. Of course we didn’t shower because it was way too cold and there was no hot water. (It’s the same throughout all the guesthouses there btw). We trekked up for about 10 minutes to a viewpoint where you can see turtuk from above. Subsequently, we had dinner at our guesthouse (nice food too) and retired for night to prepare ourselves for the long drive tomorrow. Day 6: Turtuk to Pangong Tso. The legendary Pangong lake that is a must visit if anyone goes to Leh. It was a crazy ride to Pangong Lake, extremely bumpy so don’t eat too much for lunch or you might just vomit everything. If I have a choice, I would not stay at Pangong because everything was so overpriced! but when we arrived, it was pretty late already after taking all the pictures, it was already 6+ pm so we kind of had no choice but to stay at Pangong. IT WAS FREEZING COLD! Cottages (concrete walls) were priced at 3500 rupees up (ridiculous man), we managed to bargain down to 2000 rupees. There were also tents available but that was out of the question for us because the cold was unbearable and I think I won’t be able to sleep if I had gotten a tent. The room came with an attached toilet but again, only cold water. We did not shower for 3 days till we got back to Leh. With that said, Pangong was absolutely stunning! It would be a great wedding photography estimation if it wasn’t so hard to get to. Day 7: Back to Leh (Finally) at around 5pm (we passed by Thikse Monastery on the way back). Checked into rainbow guesthouse (again!) and it felt like home upon returning. They had hot water and everything was nice and comfy after the 3d2n out in the wild. We had dinner at bon appetite (apparently the BEST french restaurant with good reviews), opened by a french lady. Sadly, it wasn’t to my liking and it was pretty pricey for India’s standards. But then again, comparatively to Singapore, it’s quite cheap I guess? (950 rupees for two mains). Day 9: After getting down from our Jeep ride, we had breakfast at this hotel with free wifi. Then we bought a bus ticket from Manali back to Delhi. My time in Manali was horrible, because I accidentally gave my eye an abrasion (basically my fingers scratched my eye) and it was so painful that I thought it was an eye lash stuck inside. [I only knew it’s an abrasion on hindsight after I got back to SG and found an eye doctor to treat me]. The pain was so horrid I couldn’t open my right eye at all, and I went all over to find an eye doctor. The worst thing, they only have 1 eye doctor in the entire city. Went to the hospital to find that dude only to realise he was on leave that day. What are the chances?! So I had to bear with the pain for the entire day, plus my overnight bus ride back to Delhi. Worst nightmare ever. Day 10: Reached Delhi, hopped onto a tuktuk rickshaw and checked into a hotel (can’t remember the name). We decided to treat ourselves to something nice after roughing it out over the past 1.5 weeks. Went around the city to look for nice food and shopped around a little to finish some of our excess rupees. We budgeted $1500 for the trip but I think we only ended up spending around $1200+? Day 11: Flew home at night. Would I do this again? Nope! It’s a once in a life time experience, I loved every moment of it but once is enough! If you haven’t hopped on a plane to India yet, PLEASE DO! Ladakh is so incredibly beautiful, and you gotta do it only when you’re young and able to rough things out. The jeep rides are definitely not for the fainted hearted, 13-15 hours drives (with 1-2 stops only) can get a little crazy, but it’s well worth the scenery that you’ll see!